Cool Calories 100® Dry Fat supplement is an excellent source of calories for horses and contains more than two times the energy of carbohydrates. The high calorie density of Cool Calories 100® provides cool, focused energy for performance horses, calories for underweight horses and hard-keepers and reduces the need to feed more grain. Cool Calories 100® can be fed along with fortified feeds. It contains fatty acids for a full, glossy coat. 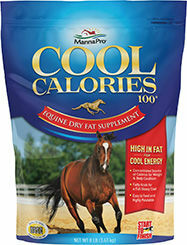 Cool Calories 100® is easy to feed and highly palatable. Feed Cool Calories 100 mixed into the grain portion of the diet at a rate of 2–4 oz. per horse per day. Larger volumes (3–8 oz.) can be fed to underweight performance horses undergoing intense training. One measuring scoop holds approximately 1 oz. of Cool Calories 100. Check cup quantity periodically.